Etsy is the perfect place for anyone who loves to make things or likes to generate an income while working from home. Etsy offers a platform where millions of makers around the world connect to make, sell, and buy unique handmade and vintage items and supplies. You can make and sell pretty much anything on Etsy, from Apple watch bands to Zootopia costumes. I have been selling handmade Islamic crafts on Etsy since 2013 and my shop figsandolives just made its 45th sale this year alhamdulillah. It worked really well for me since I am a homeschooling mom who wanted to generate an income without sacrificing homeschooling and other priorities of my life. If you love to make things and want to take your hobby to the next level, Etsy is just the place for you to showcase your creations so others can enjoy and benefit from it. Deciding on an item that you want to sell on Etsy can be both easy and challenging. It’s easy if you’re sure of what you will be selling. It can become a challenge if you’re good at making a number of things and now having a hard time picking just one thing to sell. You can solve this dilemma by choosing 1 item that you make best or an item that has a purpose close to your heart. You can introduce other items once you’re familiar with making and selling your product on Etsy. Choosing a shop name is the first step to building a strong brand for your shop. Pick a name that’s unique and memorable. 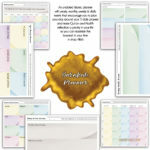 You can name your shop that reflects the product you will be making or you can pick a name that resonates your values. You can also use your name for your shop. If a name is not available, add a studio, op, co, made, workshop, boutique etc. I wanted a name with a Quranic theme so I named my store figsandolives. You need to become a registered Etsy member to open a shop on etsy.com. Once you register, you can start the process of opening your shop yourself. All you need is your computer and your store is only a few clicks away. Joining Etsy as a seller or buyer is free. You will need to upload photos to create a listing. The better photos you take the more your items will speak for themselves. A basic listing can include up to 10 photos. Take well lit, clear photos of each item in natural daylight instead of using a flash, showing any unique details, angles and the scale of the item. Style your photo with props or use a model to style it for you. You can invest in a good camera and experiment with the pictures when your shop grows. Think like a shopper when it comes to listing your title. What words would you use to look for an item when you’re shopping? Think about it and use these words and phrases as a title for your item. Include descriptive words- colors, materials, use, techniques, or it’s intended use, like ” Recycled paper art”, ” Embroidered tea towel”, etc. After giving a title to your item, you will need to set a price value for it. You want to price your items right so both you and your customers feel good about the price. Before deciding on a price, you need to take account of all the costs that are involved in making your item. This includes all the materials and supplies that went into making the item and the time you spent to create it. Paying yourself fairly should be your top priority. You want to come up with a number that you would like to be paid per hour for the work you’re doing for your shop. If you’re unsure about the price for your time, find out about the average price by doing a quick search on Etsy for a similar item and then decide on a price for your item/s. Also, keep in mind that while there is no fee to register your shop at Etsy, they charge $0.20 to list an item and retain 3.5% of the sale price. These facts are important to keep in mind when setting prices. You can always change your listing price later if needed. Here’s your chance to show your item in the limelight. Your listing description helps shoppers know what you’re selling and what’s so special about it. Use short, descriptive sentences to illustrate what your product is, how a shopper can use it, etc. Include dimensions, color/s and other specific details that a customer needs to know before making a purchase. Shipping fees vary from country to country. Determine your shipping cost by going to your local post office and find out which shipping option is most suitable for your shop. Get an estimate based on the size and weight of the items and add the cost of shipping supplies like cardboard boxes, bubble wraps, packing peanuts, labels etc. This is the last section you’ll complete before you can open your shop. You will need to provide Etsy with your bank information to set up payments. Etsy allows you to accept major credit cards, PayPal, Etsy gifts cards etc. from the shoppers. You will receive a bill from Etsy that includes a $0.20 listing fee for each item that you’ve listed, any applicable renewal fee for your items and the 3.5% of the price of each item that was sold from your shop. You can pay your bills through a credit card or via PayPal. Once you have provided Etsy with your bank information, you are ready to open your shop. Once your shop is open, shoppers from around the world have to your shop and can find your listing when they search on Etsy. You can keep working to improve your shop after you open offering more great looks and unique items. 1. Carve out time for Etsy. Have ambitious yet realistic goals and create a step by step, bite-sized plan so your dream turns into a reality. Life will happen to you while you get used to owning a shop, and a set plan will allow you to create with less stress and more focus. 2. Take time to get to know your niche market, it’s an important step to selling online. 3. Practice Ihsan while making your items. Do your very best and then make improvements by exploring and experimenting with your products. 4. Provide stellar customer service. Serve your customers with integrity. Be honest about materials, quantity, shipping time and go the extra mile to ensure the finished product closely resembles the photo in your listing. 5. Don’t compare your beginning with someone else’s middle. Focus on your work, learn from your mistakes and be present with your work. 6. Network with others and promote yourself by joining Etsy teams, following community members, commenting on blog posts, and keeping up with your activity feed on social media. 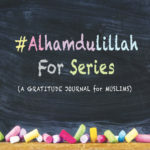 Author’s Bio: Farhana writes at simplymuslimmom.com – sharing practical tips to live a simply great life on a budget. She is a homeschooling mom of 2 kids who owns an ETSY shop called Figs & Olives. 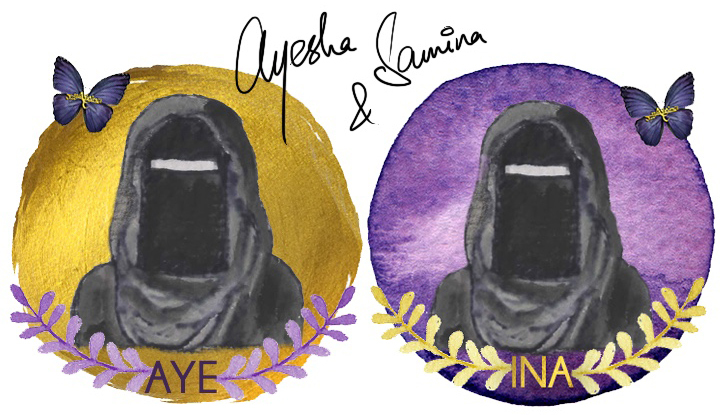 This shop was created to provide handmade, reusable Islamic crafts for muslim families while generating a halal income from home. Farhana is an avid reader who also loves to do random acts of kindness. 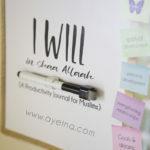 Everything she does is made possible only because of the blessings from Allah (swt). Ma sha Allah very well written. It sums it all up, now I can simply forward this article to whoever is interested in opening an etsy shop instead of me telling all these. Jazakillahu khair. As an Etsy shop owner myself (really need to work on that though) I really needed to read this: “There is hardly any overnight success when it comes to Etsy.” jazakillahu khair. All those super successful etsy shop owners / youtubers really make us feel some times that we can never get there. May Allah help us all aameen. I love Etsy!!! It is such a wonderful venue to showcase homemade works, and to support artists!!! 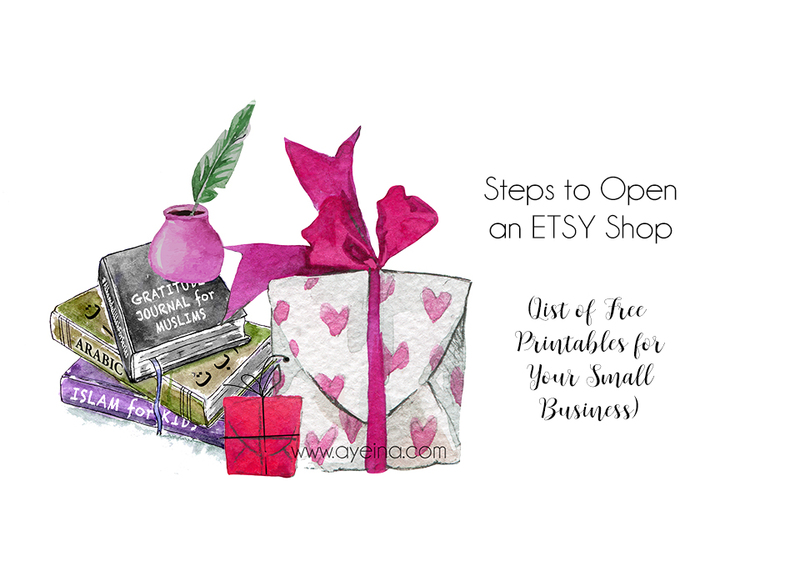 This is such a helpful guide to open an Etsy shop! I’ve always been curious about how it work. Jazak’Allah khayr for sharing! Jezzakallahu khair .. a very useful article masha allsh.I love to do hand made stuff and good at it . Have to give a try and see insha allah .